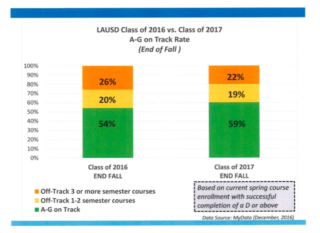 EXCLUSIVE: 42 percent of LAUSD’s record graduation rate was due to credit recovery or makeup classes. Forty-two percent of LA Unified’s 2016 graduates re-took a class they had previously failed or needed some other kind of credit recovery in order to graduate, district officials said Thursday. Superintendent Michelle King announced in August that the preliminary graduation rate was a record 75 percent, but the district had not calculated how many students needed to take credit recovery courses to get across the graduation stage. The quality of those courses, in which most of the work is done online and over a shorter period of time, has been questioned by LA Unified watchers as well as those within the district, including the school board president. LA Unified’s credit recovery policies allow students to opt out of much of the coursework if they pass a pre-test. Other districts’ policies are stricter. 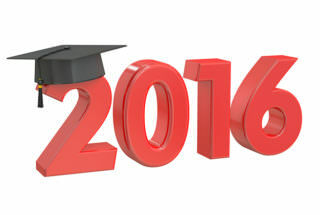 Twelve months ago, district data showed that just 54 percent of seniors were on track to graduate. King called for “all hands on deck,” and the school board committed $15 million for credit recovery programs. Chief Academic Officer Frances Gipson, who heads up the credit recovery efforts, and Cynthia Lim, executive director of the Office of Data and Accountability, said they couldn’t compare the number of students who needed credit recovery to previous years because in 2016 there were more rigorous graduation requirements, including that students pass a series of courses, known as A-G, that are required for admission to Cal State and UC colleges. Some students have also opted to re-take a course to improve their grade, Gipson said. To do that, the district is focused on students’ individual graduation plans, which chart what is required for each student to graduate, and “personalized pathways,” which include adult school and dual enrollment in community college. “It’s not a single strategy,” Gipson said. The district has launched a Graduation Progress Dashboard that shows students, parents, teachers and administrators where students stand in their progress toward graduation. District data show that 90 percent of high school students had completed their graduation plans and 92 percent of middle school students had completed theirs as of December. The district had not calculated the number of seniors who required credit recovery or who made up classes that they failed as of last week, according to a district spokeswoman. Lim said it was difficult to calculate the percentage of graduates who had made up classes, but moving forward the district is creating a way to clearly identify credit recovery options in the student records system. In the credit recovery program, students without enough credits to graduate retake classes during free periods, after school, on Saturdays and during winter and spring breaks. Many of the courses are online and either have a teacher running the class along with a computer program — known as blended learning — or are completed entirely online, known as virtual learning. One online program in wide use by the district, Edgenuity, has students taking eight five-hour sessions. If students prove proficiency with the material they receive a C grade. A’s and B’s aren’t an option. Gipson noted that many students can arrange their schedules to take the additional courses within the school day during free periods. It appears as though the number of seniors who will require credit recovery may be reduced this year. District officials told the school board this month that more students were on track to graduate this year than at the same time last year. As of December, 59 percent of seniors had passed their required A-G coursework while 54 percent of seniors had reached that same benchmark by the end of the fall semester last year. Data show 19 percent of seniors this year are one or two classes and 22 percent are three or more classes behind. Last year, 20 percent of students were one or two classes behind and 26 percent were three or more classes behind by the end of the fall semester. King announced in December that her top goal is 100 percent graduation, although it is unclear when and how the district will get there. When her strategic plan was presented in December, the school board gave its tepid approval but did not vote on it. Some academic scholars and institutions are skeptical of online credit recovery programs, saying they are an easy way to boost graduation rates without boosting student learning. LA Unified school board President Steve Zimmer said late last summer he was concerned about the district’s online credit recovery efforts and very skeptical about the programs’ effectiveness. He emphasized a need for individual education plans for students and academic counseling.